Still doubt that $200 can be enough for a pair of high-quality headphones? Then you are on the right track reading this article. We will prove that top-notch headphones can cost even less than two hundred-dollar bills put together. By the way, you can also check our lists of the best headphones under $100 and earbuds under $50 as well. Selecting the best headphones under $200 is not a difficult task, but only if you know how to do it and where to look for. As well as any item headphones include a range of options and characteristics the absence or the presence of which make them either the best or the worst product you can choose. Below you can find the main secrets of a successful purchase. A verdict on any product is partially subjective. Every time we make a choice we take into account not only technical characteristics but also our own requirements. Thus, if you want to get the best headphones ever check whether the chosen item has not only all updated options but also meets your preferences. Great performance means great sound quality. Before you purchase headphones always test them connecting to your smartphone or any other device. Listen to your favorite song. Does it sound the way you like it? Aren’t there any squeaking-creaking sounds that cut your ears? The next thing is to check the quality of lows, mids and highs. And here comes the moment for your likes and dislikes. If headphones have everything well-balanced then we may consider them to be ideal. But what if you adore crisp highs most of all? In this case, headphones with outstanding highs will be the best choice namely for you. Another important thing is to make sure that your future headphones have noise cancellation. This feature will prevent you from being distracted from music by any external noises. Still, remember that noise cancellation may be either active or passive. Both of them have pros and cons and differ in their work. Passive noise cancellation is also called noise isolation. Its working principle is based upon the reduction of outer sound due to the perfect fit and seal around your ears. Unlike noise isolation, ANC includes digital signal processing (DSP) technology. Such headphones have a special audio processor, which cancels out the external sounds by producing the opposite ones. When choosing ANC headphones make sure that this function can be turned off. This is important for your safety as when crossing the street you should be able to hear what is going on around you. Besides, check how it affects the general performance. Note that active noise-cancelling headphones will be also beneficial for your health. You won’t need to turn the volume to maximum in order to drown out the outer sounds. Your ears will appreciate this. All headphones can be divided into three types according to their form factor, the choice of which depends upon several things. In-ear headphones are also called earbuds. 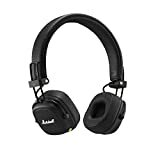 Due to their small size and light construction, these headphones are great for those who like listening to music or any other stuff wherever they are. In-ear headphones won’t take much space either in your bag or jeans pocket. What is more, they are convenient in use when doing some physical activities. On-ear headphones are also called supra-aural. They are somewhere in the middle between in-ear and over-ear headphones. Such form factor provides open sounding as it doesn’t isolate the environment around you completely. Over-ear headphones have the largest form factor. As they completely cover ears, they can provide better passive noise cancellation. Over-ear headphones are known for their comfortable fit. Still, they aren’t highly-portable. You can learn more about the difference between these form factors here. That’s the question of your personal comfort. If you hate cords because they get tangled up every time you put your earbuds into your pocket or bag then the choice is obvious. However, keep in mind that wireless headphones have a limited battery life which you should always keep under control. That is why, when choosing wireless headphones always check their battery life and connectivity. Check whether headphones have the type of connection you need. By the by, nowadays there are plenty of headphones which support both NFC and Bluetooth connectivity. Remember that you can also buy Bluetooth headphones with an extra cord. Such combination will give you the freedom of choice. One of the most crucial factors which will help you decide whether the chosen item is worth recommending is comfort. It’s really important to select headphones which won’t make you tired after several hours of wearing. Note that all types of headphones are suitable for different situations. Thus, if you like listening to music during your morning jog then in-ear headphones will be the best option while over-ear headphones will suit perfectly well for gaming. In a word, you should know exactly what you will use your new headphones for and don’t forget to try them on before a purchase. Remember, that comfort is a part of your health care. Always check the build quality of your future headphones and make sure the materials are durable enough. Some of the headphones can be also water-resistant or have universal weather-sealing. Plantronics BackBeat PRO 2 are one of the best noise-cancelling headphones to choose from. They have a powerful battery life which reaches up to 24 hours of continuous performance. These Bluetooth headphones can perform within 330ft distance from the working device and have an option of instant NFC pairing. 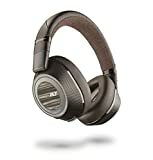 Plantronics BackBeat PRO 2 has a quite specific design which combines black, brown and silver tints. Still, it’s convenient in use as you can control all options offered by these headphones (playback, volume, active noise cancellation, power, pairing and phone calls) just lifting your hand to the left or right earcup and pushing a necessary button. Unlike Plantronics BackBeat PRO 2 these headphones can be proud of deep bass. Having an extended frequency range Audio-Technica ATH-M50x provides accurate and clear sound. There is also high-grade noise isolation gained through design contours around ears which is especially noticeable in loud surroundings. Audio-Technica ATH-M50x has a convenient design which includes 90° swiveling earcups, top-notch earpad and qualitative headband material. These headphones are also equipped with a durable detachable cable. 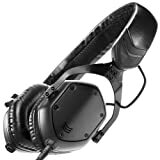 Marshall Major III can easily be considered one of the best wireless headphones. They provide a wireless connection with 30 ft range and include Bluetooth aptX. There is a powerful battery that guarantees up to 30 hours of seamless performance just on one charge. These headphones are easy to use as you can control their work with a light touch of your fingers. By the by, Marshall Major III are one of those headphones that support phone calls. You will like their solid build quality gained through the use of durable vinyl covering and thick loop wires with reinforced rubber dampers. Marshall Major III has ergonomic design that comes with articulating 3D hinges which can easily adapt to customer’s head providing a comfortable fit. Having UHQ audio support technology these headphones provide top-notch performance with immersive sound. Add to this active noise cancellation and you get a perfect guide to the world of music. Samsung Level On PRO has also got a button-free control thanks to Smart Touch option. 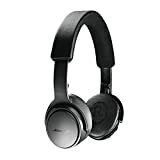 Note that these headphones support wired connectivity as well and it is very important as their battery life provides only 10 hours of performance. Another good option for headphones under $200 is Bose SoundLink. These on-ear headphones are provided with both wired and wireless connectivity. Note that their Bluetooth range covers 30ft. Bose SoundLink has an average battery life that reaches up to 15 hours and provides an option of quick charge for 2 hours at 15 minutes. These Bluetooth headphones are comfortable to wear as well. If you prefer noise isolation to noise-cancelling then V-MODA XS is one of the items to consider. These headphones come with M-Class 40mm Dual-Diaphragm Drivers which provide deep bass and crisp highs. In fact, V-MODA XS deliver every sound well-balanced. Remember that there is no Bluetooth option as these headphones are provided with wired connection only. V-MODA XS has a sturdy build as it is made of 3Dmaterial and involves fiber personalization. Looking for headphones with amazing bass response? Sony XB950B1 will be a great choice. These headphones support not only Bluetooth but also NFC connectivity. There is also a good battery life of up to 18 hours. Besides, they charge very quickly. Sony XB950B1 headphones look stylish and offer 3 colors to choose from – black, blue and red. You can make calls using them as well. Beyerdynamic DT 770 PRO are great over-ear headphones under $200. They are perfect for studios as well as smartphones and tablets. Due to their closed-back construction these headphones produce clean and accurate sound. These studio headphones come with a soft and replaceable velour ear pads that are not only comfortable but also durable in use. Besides, despite their bulky structure beyerdynamic DT 770 PRO headphones are light. These open-back headphones with Bluetooth 4.1 connectivity can become your loyal companion when travelling. They have a great battery life of 30 hours and provide mic, music and volume control. Note that all the controls are placed in the earcups, so it won’t take much time to change a song on your track list. Though these are on-ear headphones they are compact thanks to their foldable design. By the by, there is also an option of wired connection. In case you need compact wireless headphones with a comfortable fit for exercising then have a look at Bose SoundSport Free. They provide great sound and don’t jump out of your ears every time you do push-ups or sit-ups. 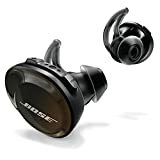 Bose Sound Sport Free headphones are also weather and sweat resistant and include three pairs of StayHear+ Sport tips of different sizes what guarantees you a comfortable fit. Still, keep in mind that these in-ear headphones do not have a long battery life and provide only 5-10 hours of performance. The variety of headphones under $200 is really great. Take into account your preferences and follow our guide to choose the best one.